Well, here we go! It’s 12:01-ish am on Monday, January 5th, and I am participating in my third bout of books. I have an insanely busy week ahead of me (something happening every single night!) but that’s ok because I will squeeze in as much time as I can into reading. 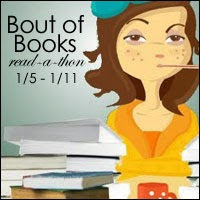 For more info on #boutofbooks, check out their website!